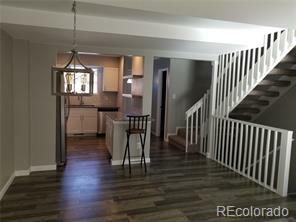 Newly updated town home with high end finishes. Open floor plan and natural light throughout. Ready for move in. Convenient location. New Stainless steel appliances. Granite counter tops. new cabinets. Nicely done, laminate high end wood flooring. New Carpet. Newer Furnace and Hot water heater. Optional open style third bedroom in basement, with private full bathroom (can be used as Recreational room or Movie room). Must see inside.